We ask you to download the app, so you will have the current information about the live location of the buses and the days of the tours. The app is free and can be downloaded in the Google Play Store and the Apple Store. 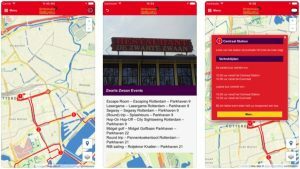 The Hop-On Hop-Off City Sightseeing Rotterdam app shows the buses in real time, the route and stops, but shows you also the best things to do in Rotterdam. In the bus, you will past the highlights and main attractions of Rotterdam. We take you along the impressive Market hall, the controversial cube houses, the impressive new Central Station and the Euromast. The app is the cityguide for tourists in Rotterdam!